Variety! I like to keep meal times interesting by injecting variety into my diet and when it comes to eating healthy, the more variety the better. This way, you’re getting a wide range of nutrients and health benefits and you don’t get sick of what you eat. Staying true to this idea, the theme of this week’s meal plan is … variety! Including Thai, Indian, and Southwestern-inspired meals, this is a delicious week of vibrant eats with fresh ingredients, and satisfying flavors. Plus, all these meals are quick and affordable to make! Ready to dig in? I hope you enjoy this week’s meatless meal plan! 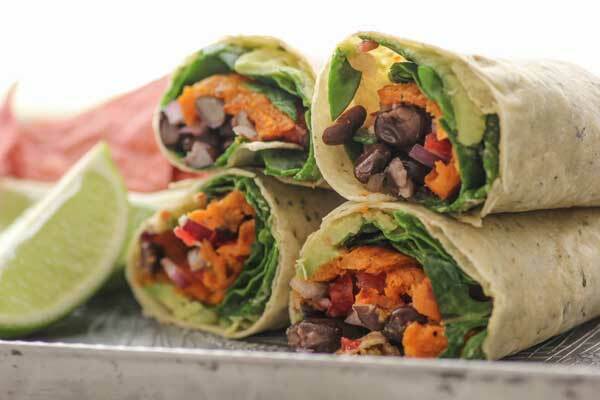 Southwestern Veggie Wraps from Oh My Veggies // Wrapping up roasted and fresh vegetables is genius for weekday meals! These Southwestern Veggie Wraps are quick, easy, satisfying, and you can easily adapt them to include your favorite veggies, guacamole, or salsa. Plus, leftovers for work lunches? Brilliant! Thai-Style Broccoli Salad with Sweet Chili Lime Dressing from GI 365 // Who says all salads have to include leafy greens? The sweet chili lime dressing for this salad is full of flavor and gives the salad a great deal of pep. To add a boost of protein, serve it with cooked quinoa. I will absolutely be making this over and over again for summer picnics and barbecues. Last Minute Sesame Noodles from Aggie’s Kitchen // Just as the title suggests, this recipe can be made in a pinch. 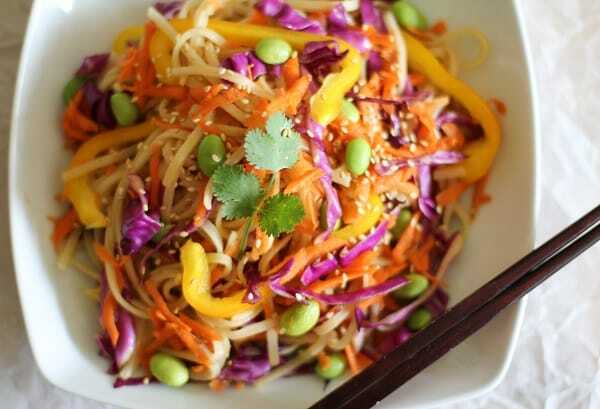 Simply heat up some noodles, chop up veggies and toss everything in a tasty sesame dressing. BOOM! Food for the whole family. This easily serves 6 people, so you can have leftovers to take to work for lunch the rest of the week. The recipe calls for spaghetti noodles, but I used rice noodles in order to keep the meal gluten-free. Vegetarian Mulligatawny Soup from The Fig Tree // Making this recipe was my first go at mulligatawny soup and it was very well received by my household. Mulligatawny soup is a traditional Indian dish. I would compare it to vegetable curry in soup-form, which is, in a word: delicious. This soup is packed with creamy, zesty flavor and lots of color. You can serve the soup with all sorts of toppings, like chopped cilantro, cashews, plain yogurt, or tofu. Crispy Cauliflower Cakes with Yogurt Dipping Sauce from The Roasted Root // I know, I know: cauliflower is all the rage right now, but hopefully you aren’t sick of it! 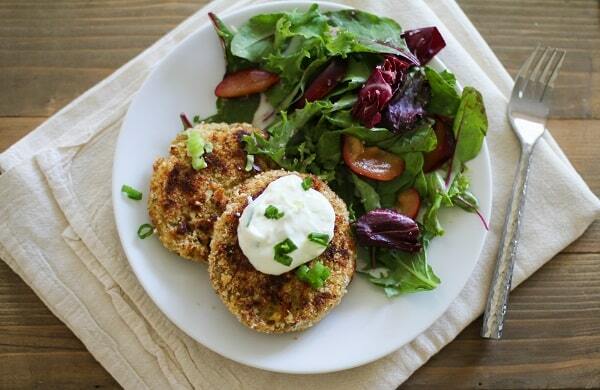 These crispy cauliflower cakes are an instant crowd-pleaser! If someone in your family swears they don’t like cauliflower, no sweat, because you’d never be able to tell there is cauliflower in these tasty treats. The yogurt dipping sauce takes only seconds to make, and it adds a fancy twist to the cakes. You probably have most of the ingredients for this recipe on hand already, and if you end up with leftovers, the cakes make for an awesome breakfast! You can cross out the avocado oil on the shopping list and use olive oil instead; if you don’t use canola oil, any cooking oil you have on hand will work, so you can cross that off the list too. Add your favorite spring produce to the Last Minute Sesame Noodles and the Thai Broccoli Salad. 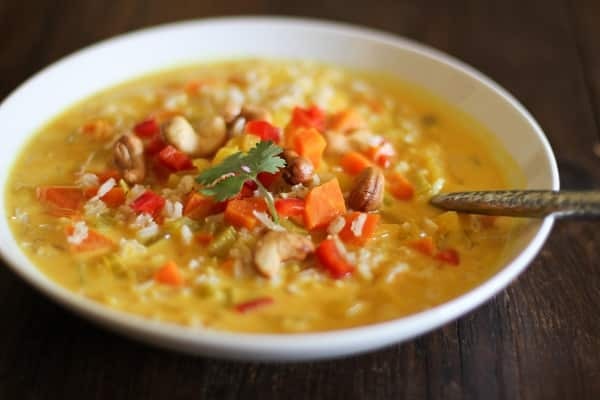 I didn’t add the optional toppings for the mulligatawny to the shopping list because you’ll probably have leftover yogurt, cashews, and cilantro from the week. You can substitute the Gruyere or Fontina cheese in the Crispy Cauliflower Cakes for any type of cheese you may have on hand. Whip up a homemade salsa or guacamole for the Southwestern Veggie Wraps, or use your favorite store-bought kind! Extra spinach from Monday’s wraps makes a perfect bed of greens for serving with the Crispy Cauliflower Cakes. Friday’s recipe calls for lemon zest, while Thursday’s recipe calls for lemon juice. Zest the lemon before juicing it and reserve the zest for Friday. Click here for a printable version of this week’s meatless meal plan and shopping list, then click on the links above to print out each recipe. Now you’re set for the week! Lovely meal plan! I’m craving those southwestern veggie wraps. Yum! You got it, Courtney! It was delicious. My household was throwing elbows over it (no joke!) 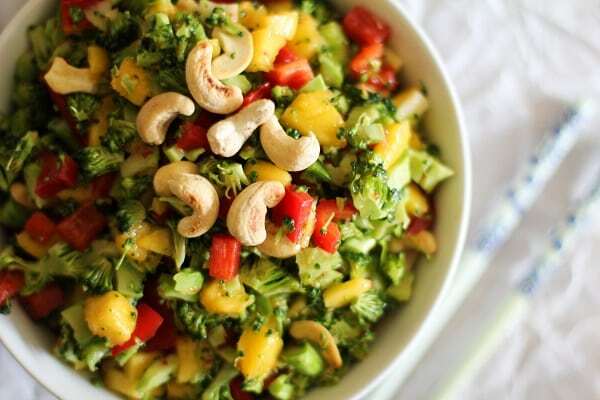 You’ll love the Thai Broccoli Salad – it’s wonderful! OH MY GOSH! Your meal plans have accomplished in less than two weeks what I have been unable to do in 39 years! Yesterday, my husband said that the recipes I’ve been preparing from your “OhMyVeggies” weekly meal plans have been so satisfying and tasty, plus, he does not feel “congested” after dinner, that he does not care if I do not cook meat for him ever again! What a great looking week of meals. I neeeeed that Thai broccoli salad! I actually prefer my salads without greens so loving this one!! Also – soup, cauli, yummo wraps…this meal plan has all the good stuff! While I love salads of all kinds, I’ve been all about leaving out the leaves lately. So glad you’re down for a leaf-less salad, too 🙂 Glad you like the meal plan, my lady! I’m always so inspired by your meal plans! Makes me want to eat some of these healthy goodies. Thanks for the Monday morning inspiration! You got it, Louisa! I find planning my meals ahead of time makes my week go smoother all around. So much easier going to the store once instead of every day – which is always what happens when I don’t plan. Let me know if you try any of the recipes! This meal plan looks so incredibly fresh and delicious, my kind of eating! Happy to see those sesame noodles in the rotation! 🙂 thank you for sharing! Update: Tried Monday & Tuesday meals and enjoyed both. Especially like the fact that I don’t have to think about what to prepare. Just follow the recipes and eat. So glad I found this website. So glad you enjoyed the Southwest Wraps and the Thai Broccoli Salad! I agree – being able to prepare a recipe without putting a huge amount of thought and energy into it makes feeding time so much easier. Thanks, KP! Gorgeous meal plan! My husband and I have recently drawn up a new household budget, and of course the thing I’m most excited about is the weekly meal plan to 1) eat well on a budget and 2) plan ahead for nutritious meals. That mulligatawny soup looks sensational, as do the ‘last minute’ sesame noodles. Thanks!! Finished out the week and the verdict’s in: two thumbs up! Luv, luv the crispy cauliflower cakes. Thank you. Thank you! I just stumbled across your meal plans and bought all the ingediants for the first week. I only spent $60 too! I had the soup tonight and it’s probably one of the best things I’ve ever made. The spice ration is perfect and there weren’t any strange surprised or issues with cook times like there are so many times with other recipes. So yummy! I’m embarrassed by all the errors in my first comment. Guess that’s what I get for typing to you from my phone while cooking dinner haha! Another hit! I tried the Sesame Noodles tonight. Perfection! Love the slightly spicy kick to it. Hey Glenn, I just looked into this, and it appears that the site where the original recipe was hosted no longer exists 🙁 I’ll keep digging around, but we may be out of luck on this one, unfortunately.